Clio Area Schools (CAS) is a 59.5 square mile district located in Genesee County, just off I-75 north of Flint. It has three elementary schools, one middle school, one high school, and one alternative school. According to Steve Keskes, Assistant Superintendent of Curriculum & Instruction, Clio is a “suburbal” district, not quite suburban or rural. As part of Genesee ISD, the district participates in a county-wide waiver to start school before Labor Day. The district’s enrollment is 2,991 students with 500 of those students coming from Schools of Choice. Like many districts around the state, enrollment has been decreasing. “This is the first year our enrollment is under 3,000,” Superintendent Fletcher Spears III shared. A large part of this is due to the decline in auto manufacturing jobs in the area as well as a decrease in birth rates over the past few decades. The exit of manufacturing jobs has also impacted the district’s free and reduced lunch rate, now at 54%, a number that has more than doubled in the past 18 years. Other data shows the district’s graduation rate increasing for the last five years and their K-8 M-Step scores outperforming both their peer group and the county and state averages. Fletcher Spears III has been part of the Clio Area Schools family for 17 years. He spent nine years as a math and science teacher at the high school and also served as middle school principal. Prior to becoming the district’s superintendent five years ago, Fletcher left for a brief period to help start the WAY Flint program, an experience that gave him a hands-on, completely different look at education. “Most of my education was primarily ‘sit and get.’ [At WAY Flint], I was able to work with several students who were very successful with the complete project-based learning (PBL) approach,” he said. Since coming back to Clio, Fletcher has overseen many changes in the district as they relate to personalizing learning for students. “We’ve expanded options for students who want something different than a “traditional” high school.” In addition to the WAY Program, Clio offers a PBL curriculum, independent online learning with Edgenuity, courses through Michigan Virtual, and a Partnership with the home school community to involve them in Clio programs and help them access learning opportunities. One of the first districts in the county to go 1:1 (computer to student ratio), the district is moving toward personalizing education for all students. Chromebooks are located on carts in every academic classroom for the students to use throughout the day. About 60% of CAS staff are using Google Classroom with their students and many teachers are moving toward a project-based learning curriculum. As Steve Keskes expressed, “You know you’re making progress when a physical education teacher asks for a Chromebook.” Through providing options for learning, tools to support personalization, professional development for teachers, and technology for all, the district continues to deliver on its mission statement of Building a Solid Foundation for Success. Below is a highlight of programs at Clio Area Schools that are moving the district toward more personalized education for their students. The Academic Innovation & Learning Center houses Clio Community High School (the 6th-12th-grade alternative school), the Clio Partnership, and Clio Community Education. Principal Tim Kumar came to Clio from WAY Flint last year. At WAY Flint, Tim worked as a team leader and administrator for five and a half years. His administrative role (completing home visits, dealing with behavior issues, and guiding students through their education) with WAY Flint prepared him for his principal position with Clio. In his second year, he has been charged with increasing standardized test scores and graduation rates for the alternative program. Clio Community High School (CCHS) is a separate reporting entity from Clio High School, a common practice for school districts around the state. This means CCHS’s student data, currently at 110 students, is reported separately from the traditional high school. Based on data from the 2014-2017 school years, CCHS became an MDE Focus School in April 2017. Focus Schools are identified as the ten percent of Michigan schools having the widest gap in student achievement between their lowest and highest performing students based on data from the previous three years. Clio Community High School’s staff is working toward reducing this gap by increasing their graduation rates. The number of students who graduated from Clio Community High School in 2018 was double the year before, and Tim’s goal is to be above 30% in 2019 to be in line with the graduation rate for similar schools. Students who enroll with CCHS have some choice in how they learn. CCHS offers online project-based learning through WAY Clio (using HERO software) and independent online learning using Edgenuity software. Every student completes an introductory course in both platforms and then, with the help of a team leader, decides how to structure their learning. Some students choose one learning option while others use both depending on the subject. Clio Community High School has two team leaders/mentors (a teacher certified in Social Studies and a teacher certified in Language Arts). An additional staff member focuses on building relationships with students as they work independently in her lab. The school has noticed an increase in Edgenuity progress since this position was added last year. This follows research that states teacher-student relationships are crucial to success. CCHS was recently awarded grant funds by the state which will be used to hire a math support staff member as well as a school social worker. The WAY Program also provides certified teachers in math and science who are available to students online and in live sessions. Last year students asked to start a Student Advisory Committee at CCHS. The group worked with the Parks and Recreation Department and police department on a park clean-up project. 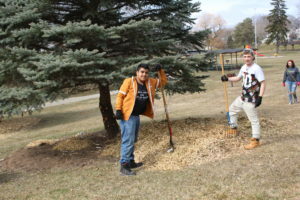 Students involved were able to earn credit through the project. The Student Advisory Committee also spent time last year at a local greenhouse. They irrigated and moved plants around as directed by the greenhouse staff. As Tim continues to build a new culture at CCHS, his vision is to involve students in community projects twice per year. 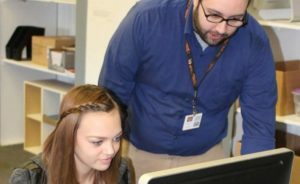 Another way a community-college-career culture is being developed at Clio Community High School is through the TeenQuest program. CCHS partnered with the Flint & Genesee Chamber of Commerce to provide after-school pre-employment and leadership training to students for free. When students complete the five-week program, they receive a quarter credit towards their elective requirements and are eligible to participate in the Summer Youth Initiative Job Fair. At this summer’s job fair, Clio interviewed 25-30 students from Clio and surrounding communities. Six Clio students received summer jobs in the Clio Area Schools technology department and groundskeeping as well as in local parks. It is expected that CCHS will continue this partnership and provide the TeenQuest option their students. Middle school students who want an alternative way to learn can also take courses through Clio Community High School. Currently, seven middle school students have enrolled in virtual courses in 2018-19. Like other districts, students choose to take online courses to work at their own pace and to escape a variety of middle school social situations. Some students come for a short period while others stay for most of their middle school years. The flexibility in allowing students to choose how they are going to learn is personalizing education for the students of Clio Community High School. Tim hopes that through this personalization, along with additional support staff, developing a culture that includes college and career thinking and community service, student achievement in math, English, and graduation rates at CCHS over the next couple of years will improve. The Clio Partnership is a collaboration between parents, Clio Area Schools, and the community. Students can take elective classes to enhance and augment their educational journey. While many homeschool families take these courses, they are available to students throughout the district. District counselors and teachers are becoming more aware of this option for students. Counselors share the courses with students and families while teachers are developing and teaching the courses. Several retired Clio teachers also teach for the Clio Partnership. In the first year of the Partnership, students showcased what they learned in karate and dance for the Board of Education. Now in its second year, the 119 students enrolled can choose from 45 class options. Two part-time Clio staff members, who are homeschool moms, make up the administrative team for the program. One works with the principal, teachers, and community partners to develop the courses and the other focuses on the paperwork side including registration and pupil accounting compliance. Like other Clio programs, Google Classroom is the backbone of the Clio Partnership. Clio teachers work with community partners to develop the courses. The certified teachers are the Teachers of Record and create the online course content using Google Classroom. Background-checked community partners provide additional experiences to reinforce or enhance the content learned online. 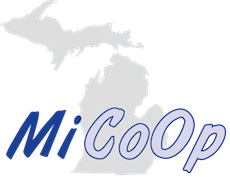 This part of the course is offered in the Early Elementary building, Clio Community High School building, Carter Middle School, and at places outside of district facilities. Courses offered include scuba diving, dance, music studies, karate, curious explorers (safety and first aid projects), robotics, foreign languages, and more. 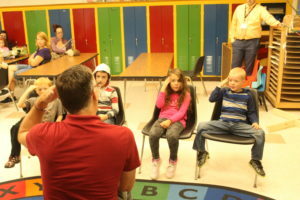 In one class, young elementary students learned sign language. As they sang/signed the Alphabet Song, they learned their letters. Through the repetitive Five Little Monkeys song, number and word recognition occurred. Even other family members learn with them as demonstrated by a student’s little sister who counted down during the song. Parents and siblings are welcome to attend classes with their students or hang out in the Parent Room in the Early Elementary Building. “The Partnership is making an impact on our entire district,” Steve Keskes stated. “We’re connecting local businesses, our community, and district. Isn’t that what the Marshall Plan is striving to accomplish?” All students attending Clio programs are benefitting because the district, community, and families are working together. Clio Community Education (CCE) is also under the Academic Innovation and Learning Center. These are classes offered by local businesses or the district to the Clio community and surrounding communities for a fee. 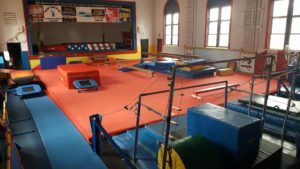 Their number one program is gymnastics which is offered in the gymnasium of the 89-year-old Clio Community High School building. These 6-week classes are offered at various times on Monday-Friday from 4:00-9:00 pm and always have a waitlist. On registration day, people wait outside as if they are camping out for concert tickets. Gymnastics is also an option for students in the Clio Partnership. Other courses offered include a Saturday morning basketball program for 3rd/4th graders, a karate program, a kickboxing program, and a latchkey program. A fun and unique countywide program will be offered for the first time in November, the Easy Oven Bake-off. Students, and a parent, from the elementary buildings will compete in a cake baking competition using Easy Bake Ovens. 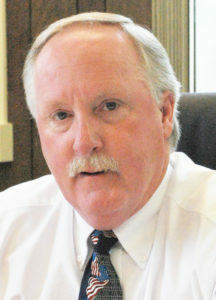 The winner from Clio will compete against the winners from other districts in the county. During the summer, CCE recreation programs include tee-ball, baseball, softball, basketball, cheer, tennis, and volleyball for elementary students. Each activity meets twice per week and is facilitated by high school students who participate on the varsity sports teams. An educational “Summer Camp” is also offered to help pre-kindergarten aged students with the transition to kindergarten. Students learn about school, the buildings, and have fun while learning. Clio High School’s Metalworking Class provides many opportunities for students to personalize their learning through real-world projects. This class, taught by Matt McMullen, combines woodworking and metalworking. During Matt’s 11 years in the district, he has updated the insides of machinery, purchased safety tools and equipment, and worked to create partnerships with local businesses. One of these partnerships is with Consumers Energy who donates large logs, essentially portions of trees, to the program. Students take these logs and cut them into boards using the portable sawmill that is owned by the district. The boards are then used for their projects. “This wood and metal shop is not like our high school days,” said Matt. “Students are learning the core skills plus how to manage time, costs, and materials.” He teaches these by building something new each year with students. When Matt came to the district, the program had machines, but not the curricular or physical structure to give students the freedom to learn the way they want. One of the students’ first projects was to design and build a loft in the lab to store supplies. A project that has become a yearly option is the toy project. Students design and build toys for the kindergarteners at Garner Elementary. Each toy is different depending on the student. “We’ll have 30 different projects going at one time,” explained Matt. The high school students give the toys to the kindergarteners in December before Christmas break. The Metalworking class has made five portable smokers. Matt gets most items discounted or donated for this project. Discount Tire has been a long-standing supporter. 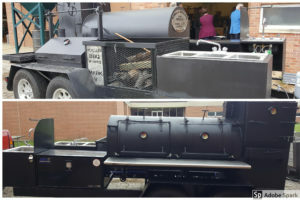 While the first year’s smoker looked like a pig, the most recent project was more than a smoker. It has a 2-burner propane stove, charcoal grill, pizza oven, running water, hand washing station, firebox, and warming chamber. All students worked on some part of the project during the class’ two daily periods. Everything on the project, except the hitch and axle, was completed by the students. “You can tell where the students were just learning to weld and where they became more proficient,” mentioned Matt when pointing to certain welds. Even the high school math teacher got involved by helping students calculate how to cut a door into the 360-degree curve. This 4,500 lb. mobile kitchen is used for the yearly Homecoming pig roast and is available for teacher functions. using the forge to make tools. making golf clubs and rings with the CNC machine. constructing wood projects like recurve bows, a wood strip canoe, small sailboats, and sheds. building a post-and-pin construction (i.e., no nails) shed. 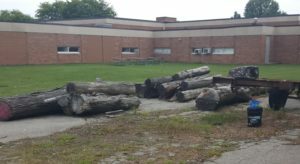 The district’s vision is to have Matt’s students build a pavilion and picnic tables in the grassy courtyard area between the cafeteria and auditorium. High school students could use the pavilion for lunch and the district could use it for school functions. Even graduates could reserve the space for open houses. The district has an articulation agreement through Baker College for students to earn college credit for the Metalworking classes. Matt and the CTE Director are also working with Mott Community College so students can earn MCC credit for the classes. Clio Partnership students will soon have the option to get involved in these projects and earn college credit as well. Carter Middle School currently houses 933 5th-8th grade students. Like many districts, the building used to be the high school. 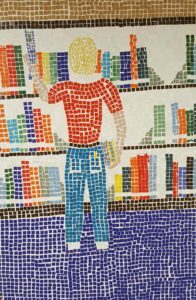 The hall leading to the library is adorned with tile mosaics that were created by previous high school students. Neil Bedell, principal, has been instrumental in bringing project-based learning (PBL) to the school. The most important piece of moving to PBL is teacher training. Teachers had the opportunity to attend PBL training through a WAY Program scholarship. One of the teachers who went through the training is Mr. McLincha, an 8th-grade social studies teacher. Mr. McLincha said he used to often lose his voice from lecturing. Now, using PBL, he gets to spend more time working individually with students and can still talk at the end of the day. Many of the teachers who went through the training, including Mr. McLincha, have become PBL leaders in the district, training and mentoring other teachers. Another piece of expanding their PBL program includes access to technology for all students. The middle school is now a 1:1 building where each student has access to a Chromebook computer throughout the day. Creating a PBL environment within traditional square cinder block rooms can be difficult, but teachers at Clio are testing classroom layouts to find those that work best for this learning environment. These include non-traditional seating options or facing desks toward the walls so discussion is held facing the middle of the room while individualized computer work is done sitting at the desks. A project that spans siloed classes is the Positivity Project. 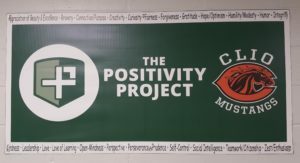 The Positivity Project is part of the schools’ Positive Behavior Intervention Systems (PBIS) plan in which Clio Middle School students and staff strive to exhibit PRIDE (Positive, Respectful, Independent, Dependable, Engaged). Teachers brought this nationwide movement idea to Mr. Bedell to help them teach students about The Other People Matter Mindset (#otherpeoplematter). This mindset comes from Positive Psychology, a scientific study of the strengths that are present in all of us that we can use to help others. Stephanie Turnage, 5th-grade teacher, piloted the Positivity Project in January 2018. Her students chose to focus on the “behavior” and “our strengths” mindsets and how they can be used to help others. They then made videos to demonstrate what they learned. Ms. Turnage has seen improvements in the attitudes and actions of her students from this project. The Positivity Project has expanded to all middle school grades and is studied/practiced twice a week during advisory class. Carter Middle School is also one of a few remaining middle schools in the state to keep their woodworking shop. Students have the opportunity to personalize their learning by not only taking this class but by personalizing the projects they work on. The woodworking teacher also teaches a course called STEM Lab, in which the students learn to program Lego Robots and use a 3D Printer. Clio Area Schools offers early education to three- and four-year-olds in a tuition-based program. Students attend the program mornings or afternoons Monday through Thursday. Also housed in their Early Education Building is the ISD-run GSRP, Head Start programs, and Clio Partnership. There are three elementary schools in the Clio district. Each building was built in the mid-1950s and has an identical inside physical layout. Currently, K-4 students attend the elementary schools. At Garner Elementary, Principal John Layni showed off an in-progress renovation project in the library. 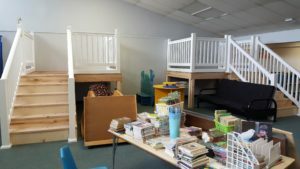 “We teamed up with United Way and worked with our Student Council to design the layout for this Reading Oasis.” The Oasis has two raised platforms where students can read as well as a place between them for wheelchair access. “It was important for us to include students with disabilities who would not be able to climb the stairs,” explained John. A canopy will connect the two platforms, making this space feel like one unit for all students. The canopy, bean bag chairs, and pillows will all be made by a local sewing group. In addition to these casual seating options, chairs of various sizes will be purchased for the library. By creating this special place to read, the school hopes its 320 students will develop a love of reading. Garner Elementary School uses the NGSS Multiple Literacies in Project Based Learning curriculum, a collaboration between Michigan State University, the University of Michigan, and the University of Wisconsin to design, develop and test materials that will engage elementary students in learning challenging ideas. The school has two science labs that all students use. Third- and fourth-grade students use the lab four times each week, second grade three times per week, and kindergarten and first grade two to three times per week. This project-based learning curriculum extends beyond the wall of the science labs into the classrooms. One 4th-grade classroom observed was working on an erosion project. The teacher was interviewing students in front of the class about a ‘Changes to Land’ assignment. Students had interviewed a family or community member, a key component to this PBL structure, about changes to land. The students shared their drawings from those interviews. As the teacher guided students through questions (another key component), they shared their evidence and which change category applied to their example. Eventually, the students will be building erosion models. Throughout Clio Area Schools there are examples of personalization occurring. Students have educational options available beyond the traditional model and the typical brick-and-mortar classroom learning environment is changing. A positive culture, a career and college focus, and an investment in professional development and technology are apparent in the district. As Clio Area Schools continues to move along the path to more choice in learning, they are building a strong foundation for the success of their students.